Kheema or Keema Matar is a very popular and well loved classic preparation of mutton, lamb or beef mince. You can even use chicken mince if you like but there is a vast difference in taste. 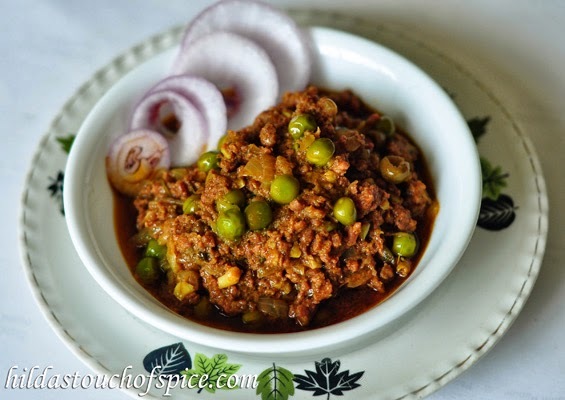 Curried Beef Mince with Green Peas or Kheema Matar as it is well known as, is also popular street food served at dhabas (roadside eateries) and small restaurants specialized in North Indian, Mughlai and Pakistani cuisine. Mincemeat or ground meat and green peas are made for each other and make a great combination with aromatic spices like cinnamon, cloves, cardamom, mace and nutmeg. The kinds of aromatic spices used may differ in combination and quantity depending on personal taste or cuisine. The Goan preparation has a few aromatic spices and vinegar is also used. It does not matter if the kheema is dry or curried, served with rice, pav, bread, naan, roti, chapatti or phulka… it just brings your taste buds alive as it is super delicious. Simple and quick which can be prepared in a pressure cooker but tastes best when slow cooked over the stove top as slow cooking brings out the best flavors. It is a good lunch or dinner option for busy mothers, working people and bachelors. Curried leftovers taste fabulous as the spices get incorporated well and can be considered for breakfast with chapattis or pav/bread or use it to make a pulao. Dry Kheema Matar tastes wonderful in grilled or toasted sandwiches, in stuffed parathas or you can fill in canapés and enjoy whenever you are hungry, or need a quick snack. Children, young or old… if you like mince meat and peas then you will surely go for it! 1 ½ tbsp. Garam Masala pwd. 1 pinch each Cinnamon & Clove pwd. 2 pinches fresh Green Cardamom pwd. Heat a wok/kadhai/pan with oil until hot. Reduce heat to low and then add garlic, ginger and green chillies; sauté for a few seconds. Add onions and sauté until soft and translucent. Then add the mince; stir to break the lumps with the back of a spoon. Saute until the mince is lump free and brown. Add all the dry spice powders and fry for a few minutes on low heat till you get a fragrant aroma. Add a few tablespoons of water in case the masala tends to stick to the bottom. Now, add the tomato puree, sugar, vinegar or lime juice and stir to cook on medium heat for about 5-8 minutes. Then add enough water to achieve desired thickness of gravy. Stir well, increase heat and let it come to a boil. Reduce heat to simmer and cook covered for about 30 mins. Add the green peas, salt and pepper to taste. Give it a good stir and cook for another 5 mins. Taste to adjust seasoning if necessary. Stir in the mint and coriander. Serve with steamed rice, pulao, jeera rice or with your favorite Indian bread, accompanied with raita or salad.